When it comes to opening her heart and purse, Petra Dominguez, will do both without hesitation. Her Tía Cuca’s husband is out of work for a few weeks and she gives her food and aid at no charge. She supports Rafael without question when he makes his run for mayor. And offers shelter to a surprise visitor. Petra Dominguez, small time tortilla factory owner, has attracted the attention of some very powerful and alluring “people”. Enter a very attractive and influential woman and her enticing business partner. Who could that dazzling couple be and why are they so interested in Petra? Are they bent on destroying her business. and her soul? How could Petra get things so riled up in this world… and the next? Is this all a dream (un sueño) or a nightmare? Lots of questions, but lots of laughs, too. And maybe a few answers? Petra’s Sueño is exactly that, a dream. A dream that examines the question of good vs. evil. The ability to make the “right” everyday choices that face us. Petra does these actions without any thought as to what she is losing (a little bit of profit in some cases) and without any judgment as to who it is. Those that have hurt her or her business in the past are forgiven instantly. Those who treat her with disrespect are given the same love that her friends get. She is approaching a level of living her life that few can achieve. At the same time her husband, Rafael, is struggling to find his courage to debate Tina in his run for mayor. Her friends, Chano and Clara, wanting to marry are hampered by pride. And her best friend, Tacha, lies in a coma after suffering a heart attack. And her competitor, Tina Tamayo, is determined to destroy her. And this is a comedy! Once again, Ruperto Reyes, Jr., takes us on look at some serious issues but in a unique comedy style. His use of Spanish and English allows for both monolingual speakers to enjoy the story. The language is familiar and the characters in Petra’s Sueño are familia. Audience members frequently comment, “That was my Tío” or “That really reminded me of my Mom”. Reyes’s play will entertain you and make you leave with a little more of an open heart than before you entered the theater. In the rural town of Las Flores, Texas, an aging Petra Dominguez is about to lose her small store/tortilla factory. Father Johnson, the new priest, ponders how to increase parishioner involvement. Tina Tamayo continues her devious and underhanded acts to undermine Petra’s store. Clara Ramirez is losing her sight and hearing in a mysterious way. Chano Orozco continues to await his MIA son from Vietnam. Rafael must trust Petra with his whole heart and then the statue of La Virgen de Guadalupe disappears from the church. To make matters worse, Petra in a morale building effort, takes advantage of the one-month free cable offer and reestablishes cable service in her employee’s break-room. It is the least she can do for her dedicated employees. Unaware that the free service also includes “premium” channels, Petra’s channel surfing lands her on an x-rated adult channel. When she finally figures out that it’s not a stick that the man has in his hands, she races to confess her “sin” before an angry God smites her. Father Johnson does some quick thinking in the confessional to combine Petra’s penance with a “get more people involved” scheme. 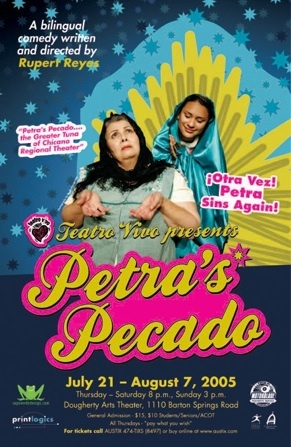 Petra’s penance; direct a play about the appearance of La Virgen de Guadalupe to Juan Diego for this year’s celebration. Petra’s inexperience, mixed with the personalities of her senior citizen friends, lead to almost certain disaster with Tina Tamayo fanning the flames. Then, a young woman “appears” and aids the cast. Through a series of “miracles” Petra and her friends begin to find strength in themselves and each other. 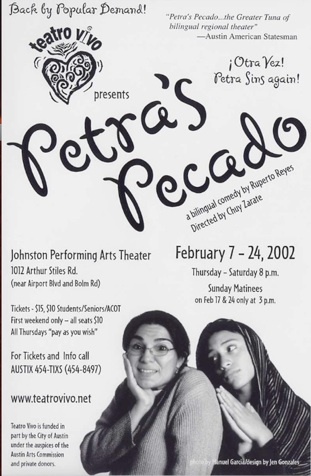 Petra’s Pecado, a two-act, bilingual comedy is a heart warming, uplifting tale of love and that everyday miracle we call friendship. 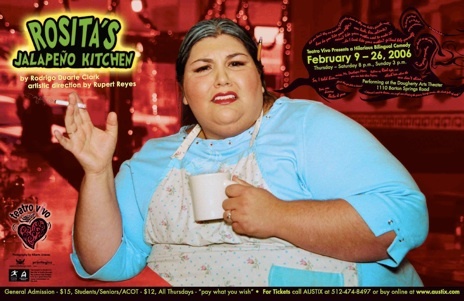 In Doña Rosita’s Jalapeño Kitchen, Doña Rosita invites the audience for the “Last Supper” in the Salsipuedes barrio. Treating the audience as guests in her restaurant, Doña Rosita contemplates selling her restaurant/home of 23 years to a big-time real estate developer, in order to make way for a brand new tourist shopping mall. Generous servings of one flavorful character after another will leave your spirit nourished. Petra Dominguez has just returned from her regular medical exam. But this time, the news is not good. The x-ray had a spot. Is this the last we’ll see of her? Will another miracle happen just in time to save her life? What does she do if she doesn’t have much time? Petra has lost touch with her daughter, Carmen. Carmen is married and lives in Austin, Texas with her husband, Michael and their two little darling devils, Carrie and Julie. Rosemary’s Baby is tame compared to these two. Petra, who volunteers to baby sit in an emergency, finds that out. Hoping to have some quality time before she has no time turns into a disaster. Rafael, a non-violent proponent, reaches for his belt. Carmen knows that not all is well at the Morales residence. And “like mother like daughter” has a plan of her own. Her husband, Michael works too many hours, her children do not have any contact with their past and now, Red Johns is on the prowl to get even with the Assistant District Attorney, Michael for what he did to his brother. And where are Tacha and Clara? Minding the store of course, until Petra needs a hand. Doesn’t Petra ever have a plan that she can do by herself? Apparently not. And what does the Llorona have to do with any of this? If Petra is involved, then no telling who may show up. 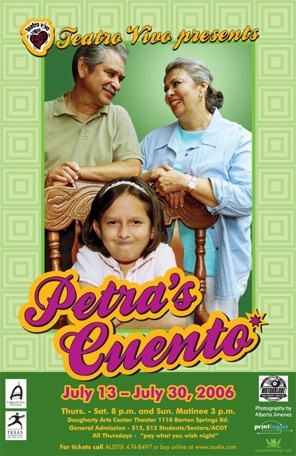 This bilingual comedy serves up the wonderfully warm and loving characters we met in Petra’s Pecado and introduces us to more of Petra’s scattered familia. “The Boiler Room is a lusty, tough-talking wickedly penetrating account of growing up in a Spanish Harlem basement. It’s a claustrophobic place shared by young Anthony, his mother, Olga, and an ominous boiler that makes its own statement and its own relentless demands. Anthony’s a heartache—a street-smart, truant, stripper of cars and super thief with an unstoppable mouth and tender heart who’s learned early that he must fend for himself and ignore his mother’s threats. In short, a survivor. Her husband, the apartment house super, is gone. (“To the store,” she’s been telling complaining tenants “He had to take two trains, a bus and a ferry.”) The tough banter between her and Anthony is unsparing. These two thrive on a chaotic, darkly hilarious diet of insult and recrimination, yet you never doubt the interdependence—a kind of fond, deadly resentment. Into this skewed world arrives Olga’s uppity, primping daughter, Olivia, and her lawyer-husband, Doug, presumably to rent an apartment. It’s an event that Olga’s been wildly anticipating. She’s counting on fleeing the boiler by moving in upstairs with them, even if it means turning out Anthony. Spanish and English are spoken in direct relationship to the process of Americanization experienced by the three generations in this story. 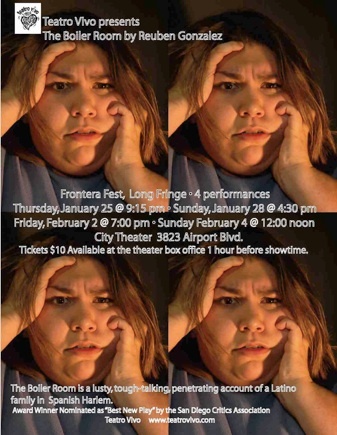 Written with a Brechtian style, intermittently using effective isolated facts and narrations, the play exposes the nation’s fluctuating immigration policy, and the way that it affected and continues to affect the lives of the people. Critic Anne Gelhaus says La Victima has “a heart felt quality to it that would come through in any language,” as it brings to light the human experience of immigration, which is seldom considered. A bilingual docu-drama focusing on immigration in a historical and personal context,La Víctima tells the story of a family affected by the Mexican and U.S immigration polices that began in1910. La Víctima follows Amparo Villa through her first crossing to the U.S as a young girl during the 1910 Mexican Revolution to the early 1970’s. Amparo’s son Samuel is lost at the train station during a mass repatriation and grows up with an adopted family in the United States. Historical facts about immigration throughout the play shape the context for their experiences after their separation, as Samuel confronts his lost heritage as an officer for the Immigration and Nationalization Service. 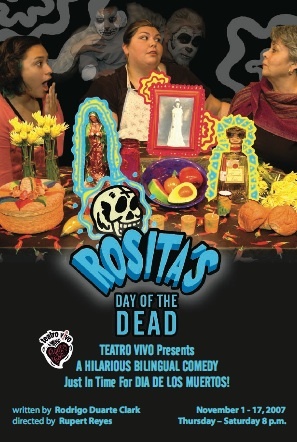 Rosita’s Day of the Dead, a bilingual comedy written by Rodrigo Duarte Clark and directed by Rupert Reyes. Everyone will enjoy this special treat for Dia De los Muertos! Join Rosita as she cooks late into the night dishing out recipes and juicy stories about the dead, the living, and the people who fall somewhere in – between. Death, as some know it, means the end, el fin, ya estuvo. no mas. kaput, adios… But not on the Day of the Dead at Rosita’s Jalapeno Kitchen! The comedy opens as Rosita prepares traditional Mexicano food for honoring the dead on November 1st, El Día de los Muertos (The Day of the Dead). You’ll get an earful from Rosita as she prepares traditional recipes and introduces you to her wacky customers, like Petra, who stabbed her husband but misses him dearly, and Lucy, whose pretentious mourning over her husband Nacho masks years of infidelity and guilt. But the real crux of the play is our deepening acquaintance with Rosita herself, and the three generations of her family who are pressuring her, from both sides of the grave, to reconcile with her dying father back in Mexico. Among them are her granddaughter Marisabel, a spunky teenage clairvoyant, and Rosita’s deceased mother, Margarita, whose comical apparitions lead Rosita on a magic serape ride through Mictlan, the land of the dead. 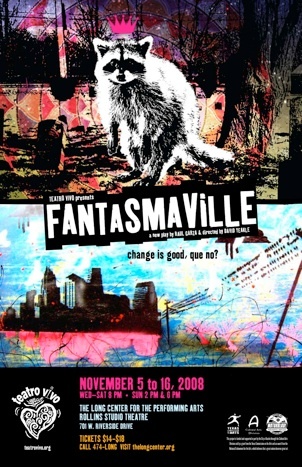 Rosita’s Day of the Dead is performed in a unique bilingual presentation style (a blend of both Spanish and English) that Teatro Vivo is most noted for producing. 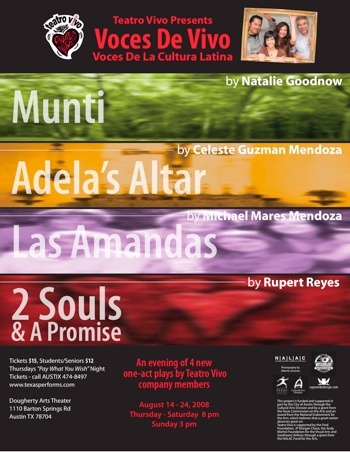 Don’t miss this hilarious bilingual comedy for the entire Austin community. 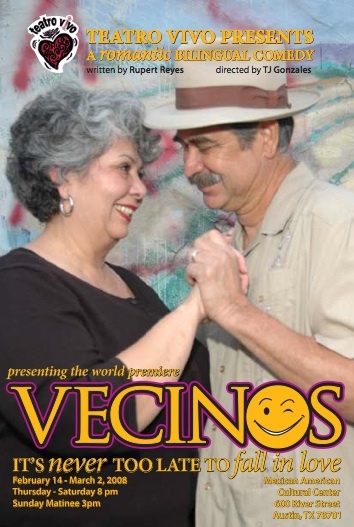 Teatro Vivo’s new bilingual comedy, Vecinos (Neighbors) is written by Austin playwright Rupert Reyes. Reyes is most noted for the popular Petraplays; Petra’s Pecado, Petra’s Cuento and Petra’s Sueño. Don Roberto is a feisty 70-year-old widower and colorful barrio icon that spends his days watching TV and threatening to scare off the young graffiti taggers using an antiquated gun with no bullets. That routine rapidly changes when a new neighbor moves in across the hall. Seventy-year-old Doña Maria catches his eye and they become more than vecinos(neighbors). ¡Ay caramba! Is it love senior citizen-style? Vecinos is performed in a unique bilingual presentation style (a blend of both Spanish and English) that Teatro Vivo is most noted for producing. This heartwarming bilingual comedy for the entire Austin community. While cleaning the altar at her neighborhood church, Adela hears the voice of God talking to her. She believes He gives her insights into other people’s problems and future. But will He help her? Celeste Guzman Mendoza is an accomplished writer and theater artist. 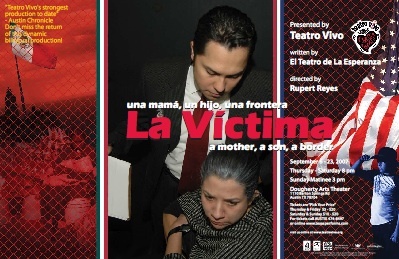 Celeste was last seen last fall in Teatro Vivo’s production of La Victima as the immigrant mother, Amparo. Muntu is a Kikongo word that means both “tree” and “person.” Natalie Goodnow’s one-woman show of the same name is a reflection on the relationships that exist between trees and people, between old Austin and its changing cultural landscape, and between the author and her many selves. It is an invitation to reflect. Natalie Gooodnow, wrote and performed a shorter version of Muntu for Frontera Fest 2008. 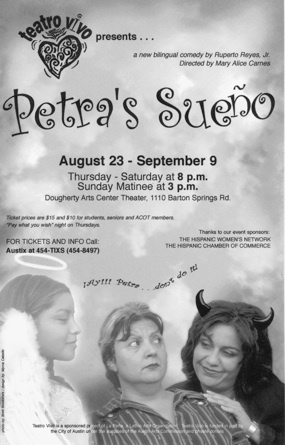 Natalie was last seen in Teatro Vivo’s recent production of Petra’s Sueño as the ethereal angel, Dolores. Las Amandas is a one – man show that tells the story about the search for love that spans 2 generations. The story follows a mother and a sister’s endless journey to fulfill a love lost in Mexico. This journey crosses more than just generations. It crosses borders. Michael Mendoza was last seen in Teatro Vivo’s recent production of Petra’s Sueño as the colorful Diablo character. Two young lovers make a promise to keep their souls united for eternity. It’s a promise,una promisa, that comes true in a way that neither would have ever anticipated. Rupert Reyes, is Teatro Vivo’s artistic director and resident playwright. He is the author of Vecinos and the very popular Petra plays, Petra’s Pecado, Petra’s Cuento and Petra’s Sueño.